WP1: Experimental platform (CCSR, CES, EPRG, Surrey Estates & Facilities): This work package (WP) establishes an experimental platform. At early stages, the platform will primarily serve as infrastructure to capture energy consumption patterns, respective consumption context and user behavioural features from real world devices and users in a working environment. The captured real world information will feed a common knowledge base, providing an initial basis for WP2-4 to develop initial approaches, establish further hypothesis and concepts and to develop required tools for further research. The overall objective of the work package is to carry out research on advanced mechanism for the realisation of the persuasive energy-conscious network (PEN). The main aim of this work package is to examine the user responses to an intelligent energy network. The research will examine in depth the views of users and stakeholders in terms of the acceptability of such a system as well as how users respond to- and interact with such technologies. The WP will examine changes in user behaviours and perceptions, it will examine technology and personal determinants of behaviour changes and it will explore issues of rebound and spillover. 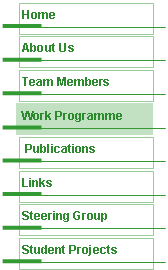 The WP is subdivided in following tasks. There are various ways of incentivising consumers to change load patterns. One of them is through financial models aimed at fostering the demand responsiveness of consumers. Those consumers who proactively engage in reducing or shifting their loads and significantly react to price signals should be rewarded by paying less for their electricity consumption. This WP will focus on the economics, demand-related and behavioural aspects of flexible electricity networks by assessing the benefits of financial mechanisms for demand side participation against the cost trade-offs associated with introducing new digital technologies. The developed models, algorithms and ideas will be tested in phased user trials. Wireless Sensor Networks (WSNs) can provide an enormous amount of data during their lifetime. Sensor data should be analyzed in an efficient and timely manner in order for the information to be of use and three models are often proposed as to where the analysis of data should occur. In the centralised model all data is transmitted from the nodes to a centralised device which analyses the data. In the distributed approach, data is analysed at each node with required information passed between nodes to maintain an overall view of the data in the network. A third approach involves a mixture of the two models.. In the distributed approach, machine learning (ML) techniques can provide a node with the tools to analyze data. Machine learning has often been developed to run on a single machine where the data is provided in its entirety and resources are not constrained. WSNs have a distributed structure where data is distributed at nodes across the network; this requires training classifiers with a distributed approach. In addition, the nodes themselves are constrained, for example in memory, CPU capacity, and energy resource, so that machine learning algorithms have to be adapted to operate effectively and efficiently in this environment. Acoustic event detection (AED) aims to detect acoustic events (non-speech and environmental sounds) i.e., gunshot, cough, clapping, door slam etc and their timestamps in order to develop a machine understanding of human activity. The application of AED systems are not only limited to the security and surveillance but in recent years researchers have found that it can successfully be applied for user context recognition. In order to detect and classify these acoustic events the techniques adopted are still confined to classical speech recognition methods i.e., use of speech perceptual features such as Mel-frequency Cepstral Coefficients and log frequency filter bank parameters that does not perform well for acoustic sounds under real-world situations due to high level of noise or overlapped sound segments. We propose to evaluate new feature sets and clustering algorithms that are tailored to increase the recognition accuracy of acoustic events specially overlapped sound segments with reduced computational complexity and power requirements so that it can be deployed on resource-constraint devices.